United first flew Americans to Mexico 50 years ago with a flight to Monterrey on February 16, 1967, and now delivers nearly six million annual passengers to 33 Mexican cities — the most of any U.S. carrier. Mexico's major cities and beach resort destinations remain popular among U.S. business and leisure travelers. Especially notable favorites include the historic metropolis of Mexico City, the tropical beach resorts of Cancun, and the cosmopolitan city of Monterrey. Mexico City may be one of the world's largest cities, but its chief attractions are surprisingly easy to visit because most are found in walkable clusters. You'll find the richest collection of cultural sites in the historic center, where you can visit the city's cathedral, national palace, Palace of Fine Arts and Templo Mayor archaeological site. The second treasure trove of sights is in the big city park, Bosque de Chapultepec. There you can enjoy a stunning castle, contemporary art museum and the acclaimed National Museum of Anthropology. Art lovers should undoubtedly make a trip to the Colonia del Carmen neighborhood, which features two museums that pay tribute to Mexico's most iconic artists: the Frida Kahlo Museum and Diego Rivera-Frida Kahlo Studio Museum. Newest to the city: Aquarium Inbursa. Boasting some of the world's finest beaches and second-largest reef, Cancun — on the tip of the Yucatan Peninsula where the Gulf meets the Caribbean — is a paradise for lovers of beach and water activities. Its 14-mile strip of beaches offers superb scuba diving and snorkeling on the Great Mesoamerican Reef, sportfishing in the Gulf, and every imaginable kind of boating. Three of the accessible islands are rich with birds and marine life, including Isla Contoy National Park. Also in Cancun or nearby: aquariums, eco-parks and numerous Mayan wonders —including walled cities and the stepped pyramid at Chichen Itza, a UNESCO World Heritage Site. New since 2013: An underwater museum with 455 submerged sculptures seen as you snorkel. Monterrey is Mexico's wealthiest and third-largest metropolitan area. Most of the city is quite modern, although the essence of Old Mexico still lives in the public squares and frequent festivals. At the Macroplaza, the world's fourth-largest public square, you can visit the Metropolitan Cathedral, Palace Museum, Museum of Mexican History and Contemporary Art Museum of Monterrey — and at night, watch green lasers shot toward the surrounding mountains from a 220-foot tower. Families often enjoy Fundidora Park, which includes Sesame Street Park and an ice rink — accessible from the Macroplaza via boat ride or the Santa Lucia Riverwalk. New since 2015: Estadio BBVA Bancomer, the 52,000-capacity stadium of Monterrey's soccer team. United Airlines also flies to 30 other Mexican cities, from Cabo San Lucas and Cozumel to Veracruz and Villahermosa. 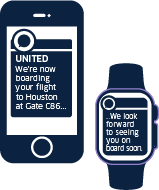 Visit united.com or use the United app to plan your visit.